Exploring the streets of London, Manchester, Belfast, Edinburgh or Cardiff, one cannot help but notice the striking transformations taking place in the urban landscapes. This prominent regeneration of urban areas in the UK and around the world has become an increasingly important issue amongst governments and populations. The growing concern has been a result of the impacts of the decline of cities since the collapse of manufacturing industries and the heightening of global competition. A range of innovative approaches to tackle urban problems have been taken over many decades to attempt to regenerate the fortunes of towns and cities across the UK. 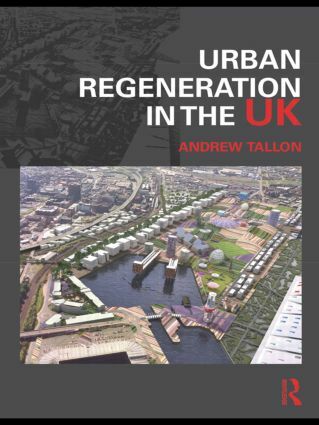 This text provides an accessible, yet critical, synthesis of urban regeneration in the UK incorporating key policies, approaches, issues and debates. The central objective of the book is to place the historical and contemporary regeneration agenda into context. Section one sets up the conceptual and policy framework for urban regeneration in the UK. SectiontTwo traces policies that have been adopted by central government to influence the social, economic and physical development of cities, including early municipal interventions in the late nineteenth century, community-focused urban policies of the late 1960s, entrepreneurial property-led regeneration of the 1980s and competition for urban funds in the 1990s. The penultimate section illustrates the key thematic policies and strategies that have been pursued by cities themselves, focusing particularly on improving economic competitiveness and tackling social disadvantage. These approaches are contextualized by discussions covering, for example, urban competitiveness policies and the focus on sustainable urban regeneration. The final section summarizes key issues and debates facing urban regeneration, and speculates upon future directions. Urban Regeneration in the UK blends the approaches taken by central government programmes and cities themselves in the regeneration process. The latest ideas and examples from across disciplines and across the UK’s urban areas are illustrated. This book provides a comprehensive and up-to-date synthesis that will fill a significant gap in the current literature on regeneration and will be a tool for students as well as a seminal read for practitioners and researchers.